If you hate running… buying a treadmill is a waste of money. Just like purchasing an indoor cycling bike makes zero sense if you’re going to let it collect dust and not use it. The point is to allow your interests to dictate what equipment you buy, not the other way around. Buying equipment thinking, “if I buy this, I’ll finally start working out at home,” is a trap. Start with a product that doesn’t intimidate you or require too much assembly, even takes up too much room. But most importantly, be certain it is something you will actually use. A kettlebell or exercise ball are great, versatile pieces you can start with. Neither necessarily require a lot of space and there is a wide variety of weighted movement you can accomplish with both. 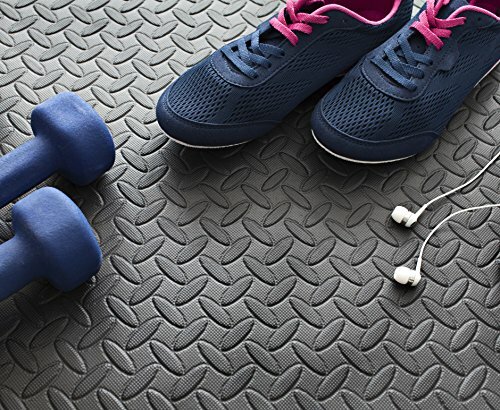 10 Home Gym Equipment Must Haves! No reason to try to build out Gold’s Gym at once. But if you’ve got a garage, you’ve got holy land for an at-home gym. The basement leaves tons of options as well. But first you need to know what you’re willing to spend. We think these products are a must have, regardless of your total budget you can buy premium products or products at discounted rates to save money. ONE SOLUTION…MANY BENEFITS: Burns Muscle, Burns Fat, Increases Endurance & Improves Flexibility. No matter the goal, TRX Suspension Training will push you to the limits and encourage results. ON THE ROAD, OR ON THE GO: Portable and convenient for travel. Your TRX Suspension Training Basic Kit was designed to go where you go. Work out in the comfort of your home, in your office, at the camp ground, or in your hotel room. TRX Suspension Training Basic Kit was designed to adapt to any workout environment. PRO-ATHLETE TESTED: Sold to EVERY MLB, NBA, NHL and NFL team. Used by professional Golfers, Fighters and Olympic Swimmers, Runners & Skiers. This is your opportunity to train like the pros! Superior quality. All of our exercise resistance bands are thoroughly tested before we ship them out to you. This ensures your bands are easy on skin and free from defects and will provide you with a worry free experience. Take a look at our bonus instructional booklet and eBook, where we include dozens of different illustrated exercises that demonstrate how to use our resistance bands for legs, arms, back, shoulders, ankles, hips and stomach. 6. Cardio Machine: Like an exercise bike! Exercise Bikes are easy to use, high quality and durable fitness equipment. Achieve your best workout with jump ropes & speed ropes. Ask any trainer and they’ll tell you that kettlebells are here to stay—and they work. Here’s why: kettlebell exercises demand the use of multiple joints, which engages all the larger muscles of the body. Compound kettlebell moves burn calories faster than isolation moves, which only work one muscle. Previous: Why Bowflex Home Gym Systems?